стабильности гемоглобина; исследования функционирования глобиновых генов. На её работы ссылаются в монографиях и книгах. Центре Диагностики Гемоглобинопатий всемирно известного профессора Тайтуса Хайсмана (T. H. J. ( DNA diagnosis of Human Hbs ) (клик читать Протоколы Диагностики). генах в электронной базе мутаций в гемоглобинах человека http://globin.bx.psu. отраслью современного здравоохранения (продолжение следует). hydrogen exchange. II. Influence of the intersubunit contact splitting - Mol Biol (Mosk). 2006 May-Jun;40(3):468-81. Russian. calcium tolerance -J Biol Chem. 2004 Mar 26;279(13):12744-54. 3. Т. Молчанова. (2004) “Лермонтов Юрий Григорьевич”. Образование и общество, №4, стр. 114-118. 4. Ames,J.B., Hamasaki,N., and Molchanova,T. (2002). Structure and calcium-binding studies of a recoverin mutant (E85Q) in an allosteric intermediate state. [beta92(F8)His-->Pro], first case discovered in a Russian patient. Hemoglobin 23, 373-378.
identified as the ATG-->ACG change in the initiation codon. Hemoglobin 22, 283-286.
hemoglobin variants on the World Wide Web. Blood 91, 2643-2644.
hemoglobin variants (1996) via the World Wide Web. Hemoglobin 22, 113-127. >Asp]; a high oxygen affinity variant observed in a German family. Hemoglobin 22, 69-73. 10. Smetanina,N.S., Molchanova,T.P., and Huisman,T.H. (1997). Analysis of mRNA from red cells of patients with thalassemia and hemoglobin variants. and subjects with terminating codon or poly A mutations. Biochem. Biophys. Res. Commun. 214, 1184-1190. >Pro in a young Dutch boy. Hemoglobin 19, 203-206. 2 136(H19)Leu-->Pro beta 2 in a Caucasian family from Alabama. Hemoglobin 19, 151-164. (alpha 1; 38 or 39 minus Thr) and a poly A mutation (alpha 2; AATAAA-- >AATAAG), results in a severe hemolytic anemia. Am. J. Hematol. 47, 198-202. 17. Molchanova,T.P., Pobedimskaya,D.D., and Huisman,T.H. (1994). The differences in quantities of alp. Br. J. Haematol. 88, 300-306. 18. Pobedimskaya,D.D., Molchanova,T.P., and Huisman,T.H. (1994). Hb Ramona or alpha (2)24(B5)Tyr-->Cys beta 2. Hemoglobin 18, 365-366.
families is characterized by two mutations: beta 111 GTC-->CTC (Val-->Leu) and beta 119 GGC-->GAC (Gly-- >Asp). Hemoglobin 18, 297-306. 20. Curuk,M.A., Molchanova,T.P., Postnikov,Y., Pobedimskaya,D.D., Liang,R., Baysal,E., Kolodey,S., Smetanina,N.S., Tokarev,Y., Rumyantsev,A.G., and . (1994). Beta-thalassemia alleles and unstable hemoglobin types among Russian pediatric patients. Am. J. Hematol. 46, 329-332.
heterozygotes. Am. J. Hematol. 45, 345-346.
variants in heterozygotes with and without a concomitant beta-thalassemia trait. Am. J. Hematol. 45, 91-93. (G1)Asp-->Gly beta 2, a mildly unstable variant with an A-->G (GAC-->GGC) mutation in codon 94 of the alpha 1-globin gene. Hemoglobin 18 , 57-60.
patients. Am. J. Hematol. 44, 270-275.
observed in a North American Indian newborn. Hemoglobin 17, 547-549. >Asp(AAC->GAC)]: a new delta chain variant detected by gene analysis in a Chinese family. Hemoglobin 17, 463-466.
unrelated families of the Canary Islands. Hemoglobin 17, 457-461.
chain variant. Diagnostic complications. Hemoglobin 17 , 295-301. >Asp, a severely unstable hemoglobin variant resulting in a dominant beta- thalassemia trait in a Czech family. Hemoglobin 17, 319-328. 33. Molchanova,T.P., Postnikov,Y.V., Gu,L.H., and Huisman,T.H. (1993). Hb A2-Grovetown or alpha 2 delta (2)75(E19)Leu-->Val. Hemoglobin 17, 289-291. Ala-->Pro in a black teenager. Hemoglobin 17, 251-254. (GAC-->CAC): a hemoglobin variant with increased oxygen affinity observed in an Ethiopian male. Hemoglobin 17, 247-250.
alpha 2 beta (2)67(E11)Val-->Met: a new unstable hemoglobin variant identified through sequencing of amplified DNA. Hemoglobin 17, 217-225. Lys-->Gln observed in a Spanish newborn and his mother. Hemoglobin 17, 269-274. 38. Molchanova,T.P. (1993). A new screening test for unstable hemoglobins using N-butanol and red blood cells. Hemoglobin 17, 81-84. 39. Smetanina,N.S., Zhestkova,N.M., Molchanova,T.P., and Tokarev,I. (1993). [Koln hemoglobinopathy: 3 patients in one Russian family]. Ter. Arkh. 65, 45-48.
unstable variant found in an Arabian boy from Tunisia. Hemoglobin 16, 267-273.
observed in a Spanish girl. Hemoglobin 16, 511-514. (NA2)His-->Leu; a new beta chain variant observed in four families from southern Austria. Hemoglobin 16, 493-501.
variant Hb F-M-Fort Ripley or alpha 2G gamma 2(92)(F8)His----Tyr. 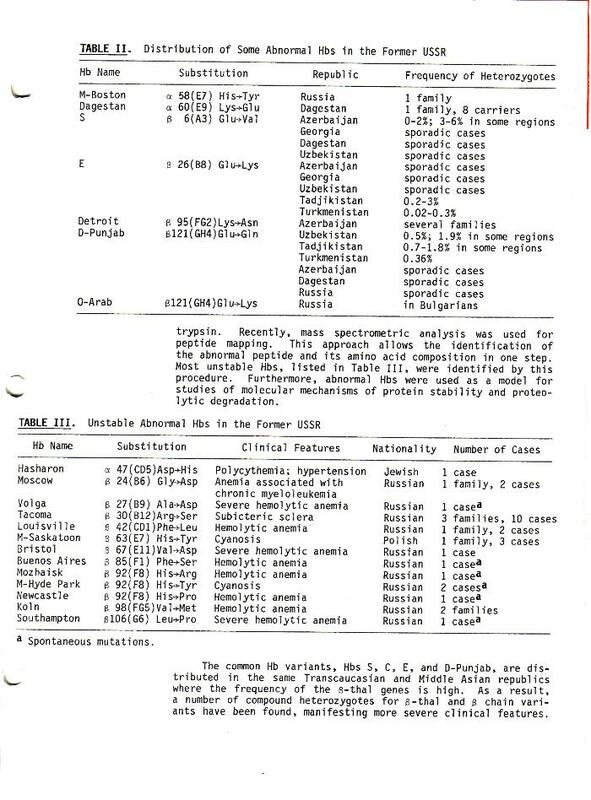 Hemoglobin 16, 389-398.
hemoglobinosis M Boston detected in the USSR for the first time]. Gematol. Transfuziol. 36, 9-11. 45. Molchanova,T.P., Kolodei,S.V., and Tokarev,Y. (1991). Expression of human membrane proteins 4.1a and 4.1b in reticulocytes and mature erythrocytes. 46. Tasheva,E.S., Zareva,Z.Z., Topuzova,S.T., and Molchanova,T.P. (1990). Hb Andrew-Minneapolis [beta 144(HC1)Lys----Asn] in a Bulgarian family. 47. Molchanova,T.P. (1989). [Basis of the molecular organization of erythrocyte membrane proteins and their defects leading to hemolytic anemia]. Gematol. hemoglobin. Mass spectrometric rapid analysis of tryptic peptides]. Mol. Biol. (Mosk) 23, 225-239. 49. Molchanova,T.P. (1989). [Detection of unstable hemoglobins with the use of normal butyl alcohol]. Lab Delo 29-31.
of unstable abnormal human hemoglobins]. Gematol. Transfuziol. 33, 39-43. 51. Kazanets,E.G., Andreeva,A.P., Molchanova,T.P., Pronina,L.K., and Tokarev,I. (1988). 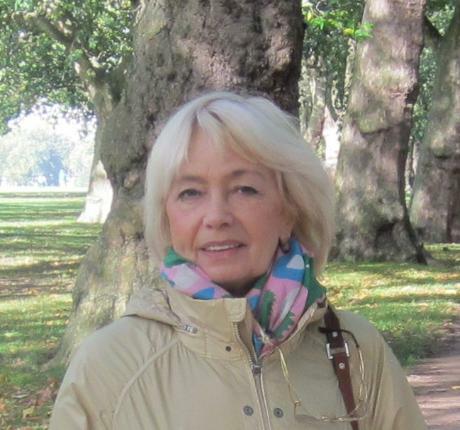 [First cases of the detection of Hb Hyde Park in the Soviet Union]. 52. Idel'son,L.I., Molchanova,T.P., Aseeva,E.A., Spivak,V.A., and Tokarev,I. (1987). [A second case of an Hb Takoma carrier in Moscow]. Gematol. Transfuziol. Bulgaria. Structural organization]. Gematol. Transfuziol. 32, 15-19. 54. Molchanova,T.P. (1987). [Functional role of proteolysis in erythroid cells in hemoglobinopathies]. Gematol. Transfuziol. 32, 33-39. 55. Molchanova,T.P. (1986). [Improved methods for the laboratory diagnosis of unstable human hemoglobin anomalies]. Gematol. Transfuziol. 31, 43-45. Punjab 121 beta Glu----Gln]. Genetika 21, 1918-1920.
and globin. I. Kinetic data and the character of the process of the breakdown of native forms]. Mol. Biol. (Mosk) 16, 1128-1143. 58. Abaturov,L.A. 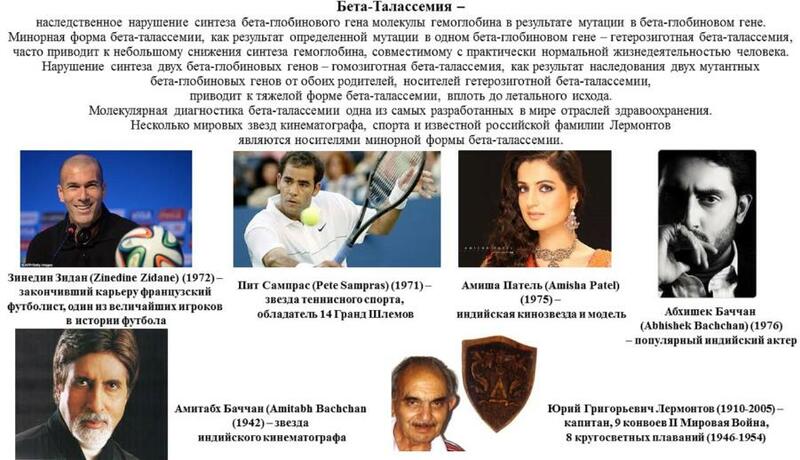 and Molchanova,T.P. (1982). [Proteolytic degradation of native hemoglobin and its constituent parts- -isolated subunits and globin. II. Correlation with the hydrogen exchange data and the mechanism of the burst-like proteolytic breakdown of native proteins]. Mol. Biol. (Mosk) 16, 1144-1164. 597. Spivak,V.A., Molchanova,T.P., Ermakov,N.V., Postnikov,I., and Tokarev,I. (1982). [Hemoglobin Lepore Boston in Bulgaria]. Probl. Gematol. Pereliv. Krovi. leads to Arg. Hemoglobin 6, 169-181.
new hemoglobin variant: Hb Dagestan alpha 60(E9) Lys leads to Glu. Hemoglobin 5, 133-138.
identification, hemichrome formation and proteolytic degradation]. Mol. Biol. (Mosk) 14, 1253-1266. 63. Spivak,V.A., Molchanova,T.P., and Tokarev,I. (1980). [Rapid and highly sensitive method of detection of abnormal hemoglobins S, E and D Punjab]. Probl. Gematol. Pereliv. Krovi. 25, 55-59.
hemoglobin isolated from a blood donor]. Biokhimiia. 43, 1175-1183.
conformational motility (conformational stability) of hemoglobin as revealed by hydrogen exchange. FEBS Lett. 70, 127-130.
plastificator of structure. - In the Book "Equilibrium Dynamics of the Biopolymer Structure", Pushino, Russia, 1990, pp.49-77 (in Russian). Abaturov L.V., Molchanova T.P. : Dynamic structure of proteins according to the data of the hydrogen exchange and proteolytic degradation- In the Book:"
Equilibrium Dynamics of the Native Structure of Protein", E.A. Burshtein, ed., Pushino, 1977, pp.5-25 ( in Russian). 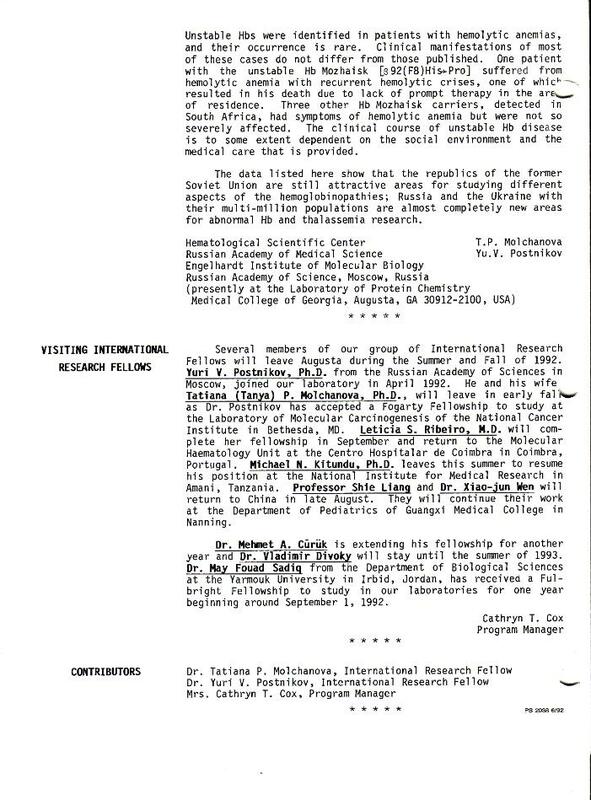 Thalassemia Parent and Patients International Conference, Malta, April, 1997. Molchanova, T.P., Kolodey, S.V., Tokarev, Yu.N. : Human erythrocyte membrane proteins 4.1a and 4.1b in terminal stages of erythropoiesis. Abst. Symp. Molecular Factors of Hematopoiesis and Stem Cells, Moscow, 1990, p. 76. 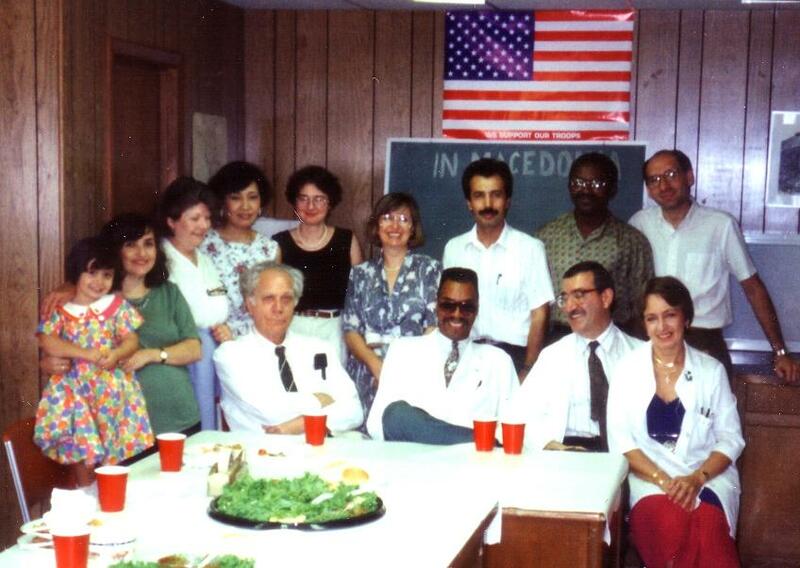 1st All-Union Symposium on Human Genome, Pereslavl-Zalevski, Russia, 1990, pp. 174-175.
structural mobility. - 14th International Congress of Biochemistry, Prague, Czechoslovakia, 1988.
stability and on Hb's affinity to the external ligands.- VI Conference on Spectroscopy of the Biopolymers, Kharkov, 1988. Symposium on Chemistry of Proteins and Peptides, Riga, 1987. Aid, Pushino, Russia, 1986, p. 113-114. Congress on Medical Biology and Genetics, Sofia, 1985, p.76. hemoglobins. - 2nd All-Union Symposium of Hematologists and Transfuziologists, L'vov, 1985, pp. 357-358.
manifestation of the human abnormal hemoglobins. - 6th All-Union Symposium on Chemistry of Proteins and Peptides, Riga, 1983, pp.137-138. Union Symposium on Chemistry of Proteins and Peptides, Riga, 1983, p.138. 55th Scientific conference of the All-Union Hematological Scientific Center, Moscow, 1983, pp. 76-78. Biophysical Congress, Moscow, 1982, pp.117-118. Scientific Center, Moscow, 1981, p. 115.
the Central Asia and Caucases. 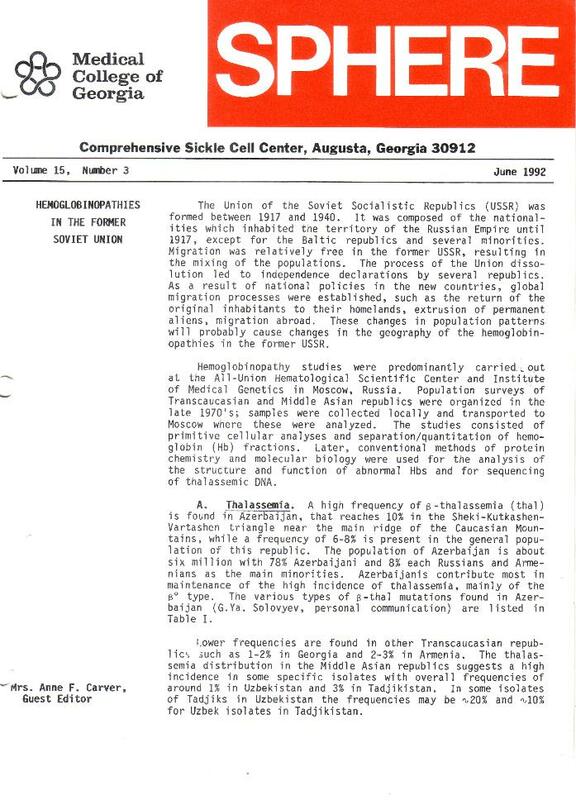 - 53d Scientific conference of the All-Union Hematological Scientific Center, Moscow, 1981, p. 101. Macromoleculars of Cell. Structure, Function, Interactions, Moscow, 1979, p. 44. Hematologists and Transfuziologists, Baku, 1979, p. 205. All-Union Symposium of Hematologists and Transfuziologists, Baku, 1979, p. 218. Mechanisms of Regulation in the Blood System, Krasnoyarsk, Russia, 1978, pp. 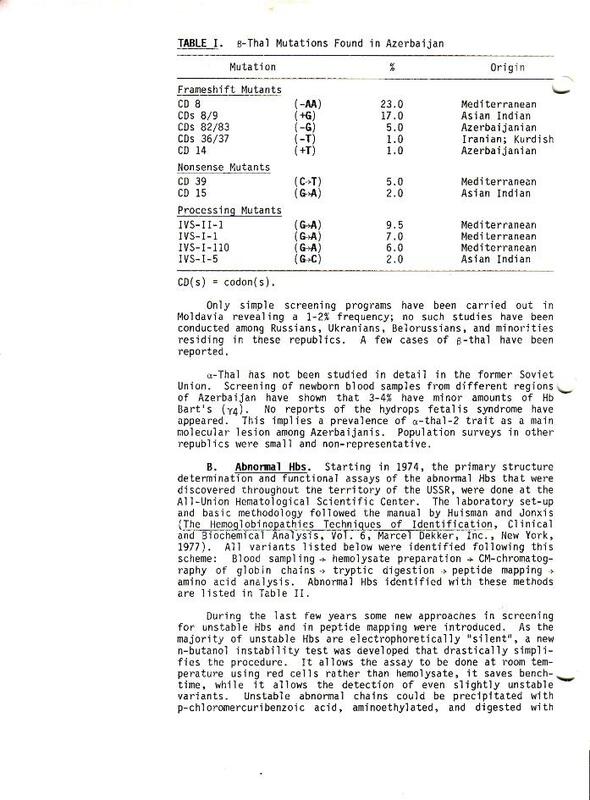 127-128.
result of the difference in conformational stability of normal chains- XIV International Congress of Genetics, Moscow, 1978, part 1, p. 25. Republican Conference on Hemolytic Anemias, Dushanbe, 1976, pp. 111-112. Changes of Biopolymers in Solutions, Tbilisi, 1975, pp.113-114. Molchanova T.P., T.H.J. Huisman - Hemoglobinopathies in Russia. Review (former USSR), Balkan J. Med. Gen., 1 (4), 143-148, 1998. Molchanova, T.P., Postnikov, Yu.V. : Hemoglobinopathies in the former Soviet Union (Review). Sphere, 15(3): 1-4, 1992. Transfus., 34: 32-41, 1989 (Russian ). Molchanova, T.P. : The functional role of proteolysis in erythroid cells (Review). Gematol. and Transfus., 32(3): 33-39, 1987 (Russian). «Государственная программы по борьбе с талассемией на 2015-2020 годы». Бета-Талассемия – наследственное нарушение синтеза бета-глобинового гена молекулы гемоглобина в результате мутации в бета-глобиновом гене. синтеза гемоглобина, совместимому с практически нормальной жизнедеятельностью человека. гетерозиготной бета-талассемии, приводит к тяжелой форме бета-талассемии, вплоть до летального исхода. Диагностика бета-талассемии одна из самых разработанных в мире отраслей здравоохранения.